(1) combine flour, sugar. yeast, eggs & water into a big bowl and stir to form a soft dough. (2) add in butter & salt and knead to combine and then set aside to rest for an hour or till double it size. (3) now, punch dough to release air then place it to working table and knead to smooth. 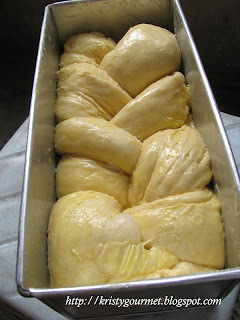 (4) roll dough into rectangle shape and place in butter. For further instruction, please follow here. To make it easier, I didn't used chilled butter. It works quicker than usual cause saving me a lot of rolling process. (5) keep the finished dough chilled before dividing & braiding. 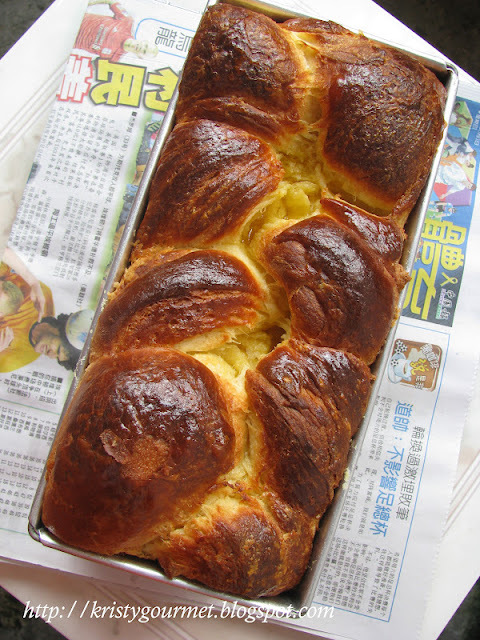 (6) place braided dough to a 4.5x4.5x10" greased loaf pan or separate them into two smaller trays. (7) bake at preheated oven 180'C for about 25-30 mins or till golden brown. (8) cooled for 5 mins before removing the hot loaf from tray. I'm sending this to Wild Yeast @ Yeastspotting & BYOB. No, I cannot believe it's mid-year! This loaf is AMAZING! Looks perfectly buttery and soft. Mmmmm....this looks so good and comforting, just the way I like it with the crust like that! You do deserve some pampering Kristy...now kick your feet up, pour yourself a cuppa (tea), and enjoy a piece of that lovely bread! You have some cool Danish recipes here, Kristy. This one is no exception. Kristy, I am back! How are you? Your danish looks so good, making me drooling especially the dark golden crust. I would be so proud of myself if I could make a beautiful loaf of bread like yours. It would be wonderful with a fresh cup of coffee. Wow, you lucky girl, won a giveaway from Sonia. I've never had such luck and doubt I ever will. 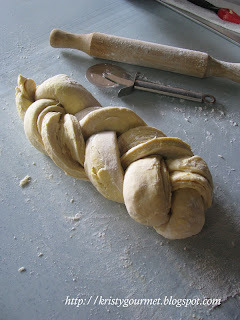 This bread looks so yummy and I love how you can braid it up so neatly! I've never tried braiding bread! Lovely results! I know, I can't believe 2012 is already 1/2 day gone....anyway, it's good to be busy sometimes. :) I love your Danish Loaf, so beautiful and gorgeous. May I have a piece??? How come the older we get the faster time goes!? I can't believe the year is already halfway over, either! This is a beautiful loaf - so buttery and tempting. I'd love it if you'd drop by and share this with BYOB - Bake Your Own Bread this month (http://www.girlichef.com/2012/07/byob-bake-your-own-bread-july-12-some.html)! 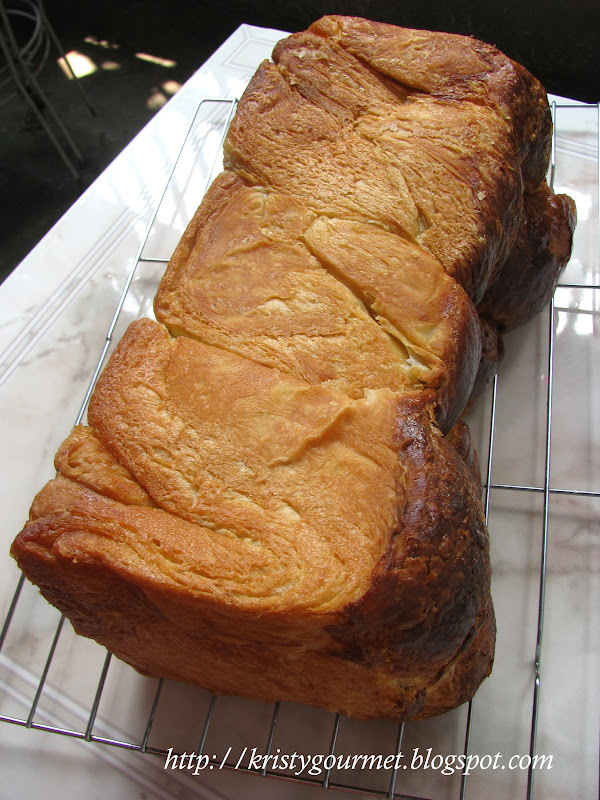 I have to tell you your danish loaf look inviting indeed, as if there are some buttery flavors floating toward me. The rich buttery color is great, along with the dark crust. Thank you so much for sharing this with BYOB. That looks really good! Great color. Did you take any pics of the inside? yeah..me too..i find the time passed by extremely fast this year and already into the 2nd half of the year! i feel like going for a holiday!! i can almost smell the buttery loaf from here..haha! very nice loaf! Hanaa : No, I didn't cause the bread was sent to my in-law's place that day. It's my mom-in-law favourite bread. A stunning loaf of bread. Lovely colour too.